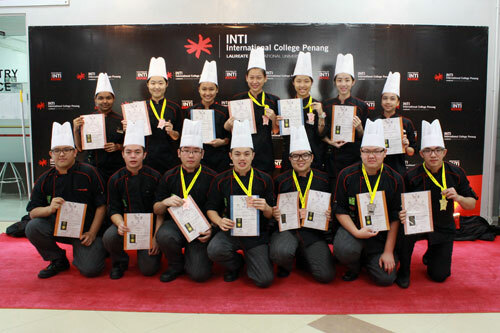 Working in collaboration with leading players in the culinary industry, INTI International College Penang provided its students with access to an excellent platform to gain exposure in the Battle of the Chefs 2014. Held at Subterranean Penang International Convention & Exhibition Centre (SPICE), this year’s Battle of the Chefs received 1589 registered entries from 1033 participants coming from 132 organisations. First row, left to right: Low Jun Keat, Alfred John Ross, Choong Kai Ern, Tan Geh Rhee, Tan Jia Qi, Daniel Wong and Soong Jie Sheng. Back row, left to right: Thivvia, Cheon Min Jung, Nur Faraneez Anastasia, Ang Hui May, Yeap Su Yinn, Yin Sue Zyan and Nurul Hasanah. More than 25 countries – including Thailand, Taiwan, South Korea, Singapore, India, China, Japan and Croatia – and eight Malaysian states were represented in the 65 categories of culinary competition, making it a truly international event. Represented by 14 students and three instructors, INTI participated in nine categories: Three Course Western Set, Hot Pasta Dish Challenge, Main Course I (Poultry – Duck, Chicken & Game), Main Course III – (Fish/Seafood), Traditional Nyonya Cuisine, Modern Stylish Wedding Cake, Plated Dessert (Asian/Continental), Modern Western Cuisine and “US Potatoes” Challenge. Led by Chef Yuzrem, Chef Syamsul and Muhammad Haziq, INTI won gold and silver medals for Three Course Western Set and Hot Pasta Dish Challenge respectively. The medal winners were Soong Jie Sheng (gold) and Daniel Wong (silver). Tan Jia Qi, Yeap Su Yinn, Ang Hui May, Cheon Min Jung, Choong Kai Ern and Tan Geh Rhee won the bronze medal. Nur Faraneez Anastasia, Yin Sue Zyan, Thivvia, Nurul Hasanah, Low Jun Keat and Alfred John Ross were awarded a Diploma. “It was great exposure for the students to participate in this competition which gave them the opportunity to prove their abilities and also market their potential to the industry,” said Christine Khoo, Head of School, INTI School of Hospitality. The panel of international judges consisted of 47 World Association of Chefs Societies (WACS) certified chefs with vast experience in the culinary field and many major culinary competitions around the world.